A unique fabrication process of low molar mass, crystalline polypeptoid fibers is described. Thermoresponsive fiber mats are prepared by electrospinning a homogeneous blend of semicrystalline poly(N-(n-propyl) glycine) (PPGly; 4.1 kDa) with high molar mass poly(ethylene oxide) (PEO). Annealing of these fibers at ≈ 100 °C selectively removes the PEO and produces stable crystalline fiber mats of pure PPGly, which are insoluble in aqueous solution but can be redissolved in methanol or ethanol. 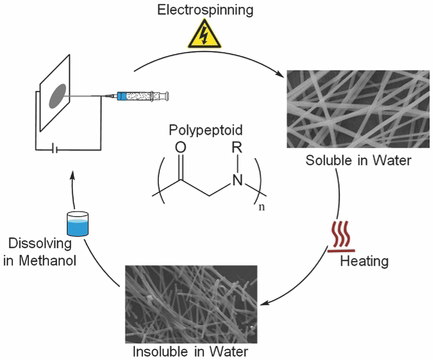 The formation of water-stable polypeptoid fiber mats is an important step toward their utilization in biomedical applications such as tissue engineering or wound dressing.